In the early 01980s, French farmers were already checking stock prices online. High school students found out exam scores, families reserved train tickets, and young women purchased clothing – all through a nationwide communications network called Minitel. First pioneered in Brittany during the late 01970s, the PTT (France’s national telecommunications provider) launched the network nationwide in 01982. Minitel was a videotex service: an interactive network run through the telephone lines, that offered a variety of services when prompted by user input. A few keystrokes on a Minitel terminal provided access to your bank account; a few others opened a telephone directory; an “online” mailbox; or a hotel reservation system. Small, grey, boxy terminals were distributed free of charge to millions of subscribers and before long, households all over France were connected to the network. As President Jacques Chirac boasted: “Today a baker in Aubervilliers knows perfectly how to check his bank account on the Minitel. Can the same be said of the baker in New York?” Chirac was speaking in 1997, exactly half way through the life-cycle of France’s greatest telecoms innovation. At the time, he could be forgiven for thinking it would last forever. This was the high point, with nine million Minitel sets installed in households around the country, an estimated 25 million users, and 26,000 services on offer. But last forever it would not: after 30 years of service, Minitel signed off for good on June 30th. Now that most people turn to the Internet for their connection to social networks, information services, and consumerism, the network has become obsolete and too costly to maintain. The Minitel was innovative for about 20 minutes, and died due to where it failed: by its centralization that never allowed it to evolve technologically: because it was under the control of France Telecom, for whom that control translated into huge profits. 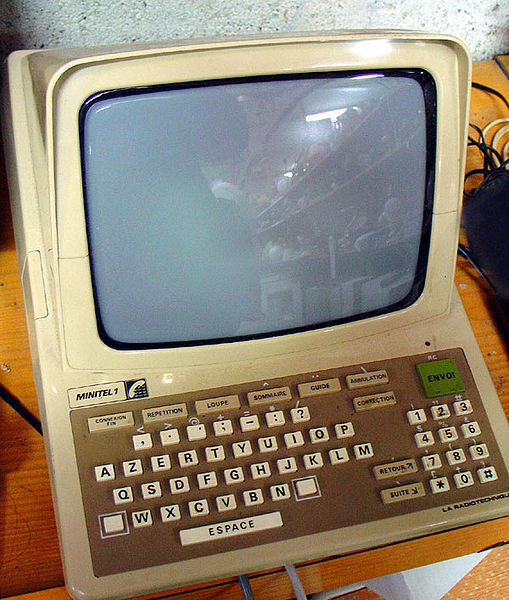 It is true that the Minitel taught French people how to use a keyboard and how to connect to online services. But it taught them the opposite of what is the most important lesson about the internet: its universality, and the decentralized character of its architecture. People forget that many of the ideas that helped form the internet were first of all tried out on Minitel. Think of the payment system, not so different from the Apple app-store. Think of the forums, the user-generated content. Many of today’s web entrepreneurs and thinkers cut their teeth on Minitel. Obsolete and doomed, or innovative and generative, Minitel reminds us not only that technology is forever evolving, but also that every life-altering technological advancement is born of something. Minitel helped shape the Internet as we know it today – just as the Internet will help shape our communications networks of the future.